Are you looking for engaging Sunday school activities for Old Testament lessons? 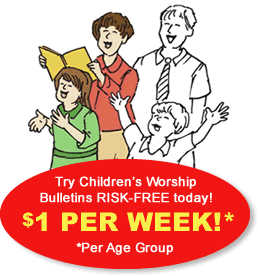 Children's Worship Bulletins include biblically based Sunday school activities for nearly every Old Testament Bible story. Written for kids ages 3-6 and ages 7-12, the bulletins make Sunday school fun. Each activity has been reviewed for educational soundness and the quality and usability of each are unmatched. Two sample Sunday school activities about Abraham and Sarah that you can use with our Children's Worship Bulletins are included in this article. Use one or both to engage your kids in Bible study! Distribute the activity page and crayons to each child. Explain the object of the activity, "Circle six differences in the second picture. Then, color all those differences yellow. Finally, color the rest of the picture, matching the colors for the things that are the same between both pictures. For example, color the well in both pictures brown or color the palm trees in both pictures green." After the children have been able to work for a few minutes, ask them, "What are the six differences between the two pictures?" Have the children show off their colored pictures to the rest of the class. Read aloud Genesis 17:1-7, 15-16 to reinforce the lesson. Explain the activity, "Let's see if we can find Abram's new name in this puzzle." First, cross out the T's and the S's from the original letters in our puzzle (E, A, W, E, N, O, R, H, O, U, H). Next, switch the first and second letters and the fifth and eighth letters (A E W E H O R N O U H). Cross out the E's and O's (A W H R N U H). Switch the third and fourth letters and then the fourth and fifth letters (A W R N H U H). Switch the W to the second letter of the alphabet (A B R N H U H). Make the fourth and sixth letters "A" (A B R A H A H). Change the last H to an M (A B R A H A M). How many materials are available? Hundreds of biblically sound, reproducible bulletins are available in our extensive library. Each is based on solid, biblical study and provides your students with worthwhile Scripture encounters. Our bulletins involve children in Bible lessons and sermons. Children remember important truths that they've learned by participating in fun activities. Our bulletins build Bible literacy appropriate to children's ages. Children love the engaging activities in Children's Worship Bulletins. Our easy-to-use search feature allows you to find bulletins quickly. Your membership allows you to download and print as many activities as you need. You'll find all the bulletins needed in one convenient site, eliminating hours of searching through books and magazines. You'll be able to keep Bible lessons fresh and new with our ever-growing library.